Sometimes you need to create a temporary file in your shell script. 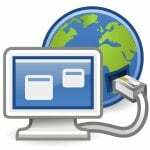 There are various methods exist to create a random temporary file name. 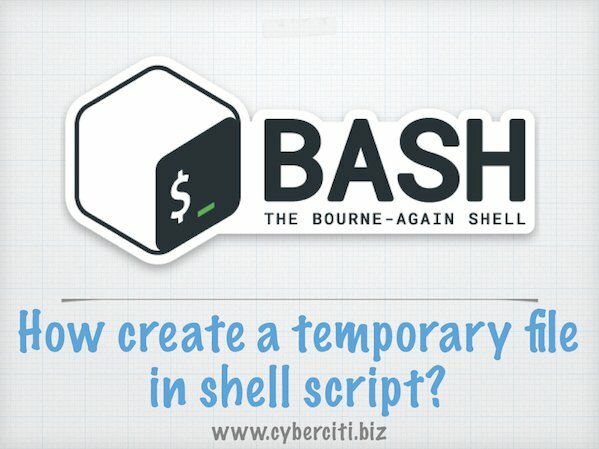 It is quite useful if your application/shell scripting needs temporary unique file names. tfile=$(mktemp /tmp/foo.XXXXXXXXX) echo "a file: $tfile"
tdir=$(mktemp -d /tmp/foo.XXXXXXXXX) echo "a direcotry: $tdir"
echo "IPv4 address downloaded to '$f'.."
#!/bin/bash s="https://server1.cyberciti.biz/?Download=ips-v4&Format=text" f="$(mktemp /tmp/myscript.XXXXXX)" wget -q -O $f $s echo "IPv4 address downloaded to '$f'.." echo "Processing..." # # logic to do something on $f here # # Delete the temp file rm -f "$f"
Rest of the following methods are insecure and do not use them in production. They are here for historical reasons only. echo "Working on temp $file ..."
file="/tmp/myscript.$RANDOM" echo "Working on temp $file ..." echo "Deleting $file ..." rm -f "$file"
echo "See directory listing in $TFILE"
#!/bin/bash # TFILE="/tmp/$(basename $0).$$.tmp" ls &gt; $TFILE echo "See directory listing in $TFILE"
Use this method if your script needs only ONE temporary file. how can i record the log in the log file in shell script? like during running whatever the user is seeing, that should be recorded in log file. Thanks for the heads up! The post has beeb updated. 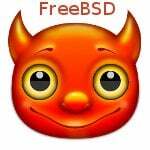 $ tempfile -d does not create a temporary directory. Instead, it requires a directory as an argument and creates a temporary file inside that directory. So your comment seems to be incorrect. PLATE may contain slashes, but mktemp creates only the final component. Thank’s. Obrigado ! Very good tutorial ! But i need to have filenames in sequence eachtime when i run the script in which i am creating the file. That said, I really don’t understand why you’d care if they were in sequence. This article is very useful: it helps me solve my problem. Thank you. After reading http://www.linuxsecurity.com/content/view/115462/151/ , I think some of your examples may be vulnerable to symlink attacks. $RANDOM (once in the filename) or $$ alone are not enough because it may be possible for an attacker to create symlinks for all filenames. It helps writing shell script! The more X’s you add the more random characters it adds. Suggest that you list the preferred method first rather than last.